Bampton Fair always takes place on the last Thursday in October. For many centuries there were two annual fairs which were essentially for sheep and cattle, the second being held on the Tuesday of Whit week but this one died out in the middle of the nineteenth century. Both were held over three days, but in time they became one-day fairs although from 2004, Bampton Charter Fair joined with another local event 'After the Fair' thus keeping the memory of the three-day fairs of old alive by extending the fair atmosphere from the opening by the proclamation on Thursday morning and running through the weekend to Sunday night. Bampton Charter Fair is the older of the two fairs, and was originally known as St. Luke’s Fair. A Royal Charter was granted on 14th June 1258 to Master Osmund the rector of Bampton to hold an annual fair at the chapel of St.-Luke-Outside-the-Town on the “vigil, day, and the morrow” of Saint Luke (October 18th). The Charter did little more than recognise the existence of the fair, and to channel money from it in the direction of the king. The fair had been mentioned in 1212, and was very likely old then. It was held in the two fields adjoining the chapel, and was primarily for livestock. On 8th September 1267, the Lord of the Manor, John Cogan, obtained a Charter to hold several fairs, two in Bampton, the one already belonging to Osmund, and another to be held on the Wednesday, Thursday, and Friday of Whitsun Week, a fair at Uffculme, another at Huntspill in Somerset, and a weekly Saturday market at Bampton. Osmund acted fast, for on 17th December 1267 the Charter was renewed to him. It was not too many years, however, before the fairs became the property of the lords. John Cogan’s grandson, John, who died in 1302 owned the rights to both fairs. Today, the fair tolls (the fees charged to anyone conducting business at the fair) are still owned by the Lord of the Manor, although since 1st June 1973, they have been leased to the Town Council for distribution amongst the voluntary organisations within the parish. This arrangement is renewable every ten years. The fairs used to be opened by Proclamation (revived in 2004), and held under the jurisdiction of the lord or his steward, who also presided over the Pieds Poudreux Court. This phrase translates roughly as “dusty feet”, a reference to the speed at which justice was meted out - before the dust from one's shoes had settled. These courts were more commonly known as “Pie Powder” Courts (it slips off the tongue more easily). The Lord or his steward would sit in a Tollbooth, and in later centuries in the Manor, or Market Rooms in Newton Square. From here the lord also collected the tolls and a sales tax from the stallholders, both being a useful source of income to him. Both fees applied also to the markets, a very good reason for there having been so many of them! The court issued immediate justice on all matters concerning the fair, including disputes, squabbles, and problems concerning price and quality. If a trader was found selling after the fair had closed for the day, he could be fined twice the amount of his takings for that day. It was also illegal for a trader to collect goods on his way to the fair for the purpose of selling them at the fair. Whilst this Court was in session, it took precedence over all magistrates’ and any other courts, whose sittings in Bampton were suspended. During the thirteenth century, and probably for many centuries after, fairs in general became a meeting place for thieves and a good outlet for rustled livestock. In 1280 a case came before the Crown Justices in Somerset (the Somerset Eyre) which involved, originally, four thieves who had committed a robbery at Bampton during the fair. They made off into Somerset where, at Winscombe, they had a row and three of them killed the fourth. A little while later, another row erupted, and then there were two. In Gloucestershire the last row took place, and the remaining thief hoped to make off with all the proceeds of the robbery to himself. Unbeknown to either him or his erstwhile companions, they had been followed at a very safe distance by a man from Bampton who reported the survivor to the authorities and had him arrested. Thanks to the gallows at Taunton Jail, “and then there were none”. 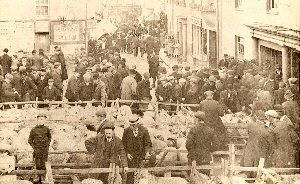 By the early 1800’s, upwards of 14,000 sheep were changing hands at Bampton Fair, making it the largest sheep fair in the west of England, but by 1900 that figure had dwindled to nearer 200. As the wool and sheep trade died, Exmoor ponies and carthorses began to appear instead, which were sold from sites throughout the streets and from stables in an orchard behind The Tiverton Hotel. Such sheep and cattle which were still part of the fair were also being sold from the streets, each auctioneer having his own regular site. The first ponies appeared in 1856, their sale having previously taken place for a few years at Simonsbath in the middle of Exmoor, the field which was used now containing the parish church. The ponies were those which remained unsold at the Brendon Pony Fair which took place on the third Saturday in October. The sale of the ponies was instigated by Mr. John Knight who had purchased the Royal Forest of Exmoor from the Crown in 1818, and was thinning the herds originally bred by Sir Thomas Dyke Acland, keeping the best to breed and providing the basis for the Exmoor Pony which still grazes parts of the Moor. They were herded at Simonsbath, where John Knight had his home, and driven on the hoof to Bampton. 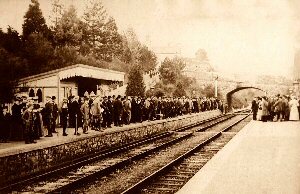 After 1884 they came and went by train, watched by what seemed to be the entire population of the town from the railway bridge. 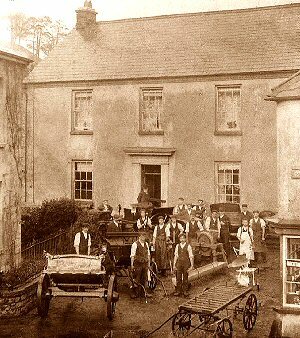 In 1860 John Knight’s son, Frederick, owned Exmoor and its ponies, and brought some fifty purebreds of 11 to 13 hands to Bampton, whilst his agent, Robert Smith, who once had farmed sheep in Lincolnshire, brought about the same number of his own half-bred cobs, which ranged from 13 to 14½ hands. The best of these fetched between 40 and 50 guineas. The largest ponies were capable of carrying up to 13 stone in weight, and fetched between 12 and 20 guineas each, some 25% less than in 1859, whilst the smaller ones fetched from “a pound a leg” to 10 guineas. The reason for the lower prices was that the animals were not as well nourished as in 1859, owing to a very wet summer, causing ruin to the hay, oat, and root crops. It was intended to transfer the pony and horse sales to Taunton in 1861, but for whatever reason, this did not happen, and Bampton remained their outlet, although between that year and 1883 more ponies went to Reading than to Bampton. Bampton Fair became famous for its pony sales around the turn of the twentieth century, when Dulverton Fair had died, and Tiverton Fair was rapidly following, being reduced to a dozen or so carthorses assembling at Lowman Green in the afternoon. This left Bampton with the only pony fair in the district, and the numbers of ponies and horses steadily increased; there were in the region of 2,000 filling the streets, the ponies fetching between £6.0.0. and £15.0.0. each. In 1928, ponies could not be given away at the fair owing, it was said, to the coal strike. 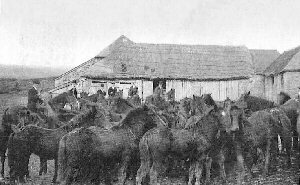 Hundreds of pit ponies had to be brought to the surface and were sold, creating a glut in the market. 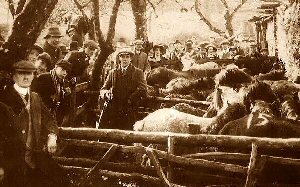 By the 1940’s the number of sheep at the fair had risen again to around 1,500, but the number of ponies, from both Exmoor and Dartmoor, had dropped to around 300. The Exmoors were fetching around £8.0.0. each, and the Dartmoors £6.0.0. In later years, ponies and horses of all kinds were being sold with as great a variety in their prices. In the 1950’s, an Exmoor could be bought for as little as 7/6d., whilst a Welsh pony cost £17 in 1971. Cattle always had a presence at the fair. Houses and shops were boarded up for the day, though not as a fence against the human element. There was one incident involving a cow walking into a tailor’s shop via the plate glass window. It later became an antique shop with a goodly quantity of chinaware(!). The public houses however, were in a somewhat different position. Their windows were constructed in such a way that they could be removed, complete with frame, for the fair, irrespective of weather or temperature. There was good reason for this. Sooner or later someone would become involved in a brawl and be cast bodily through the window. The lack of glass in the way made for a slightly safer flight, and a lot less mess and expense. The normally prim and tastefully furnished tea rooms became bare, the carpets being replaced with thick wads of paper or straw to cater for the mud and its constituents which clung to the boots of the clientèle. 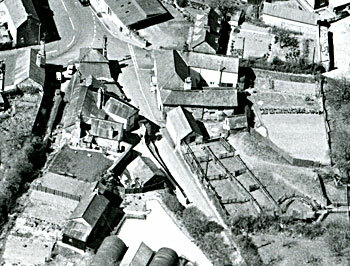 In this aerial photo you can see the Tiverton Hotel (now the Quarryman's Rest) centre top and alongside the Old Tiverton Road you can see the pony pens and the circular auction ring. Below the ponies are scrutinised by the punters. Until quite modern times the fair had few or no amusements. It was strictly for business. 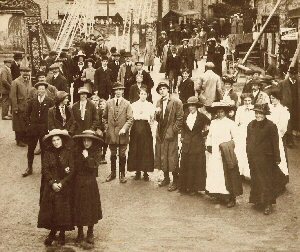 Many people settled their accounts with their suppliers and veterinary surgeons on the Quarter Days, whilst others came to the fair from a wide area to settle bills, arrange next summer’s grazing on Exmoor, and to buy whatever they could not grow or make at home, it possibly being their only visit to town from one year to the next. The larger businesses provided a free meal and drink for customers, to ease the pain of the annual payments. Some auctioneers also issued free drinks in the form of tokens to be exchanged in a local inn. One such token is in Tiverton Museum, issued by the firm of Dobbs, Stag & Knowlman, nowadays Stags, the Estate Agents. 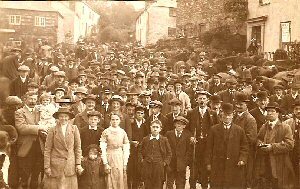 Many of the townsfolk looked forward to meeting family and friends, who made the annual fair an excuse to come and visit, a fact which is still true today. In the very early days there were no such things as shops, and the few stalls set amongst the livestock contained such wares as pots and pans, needles and pins, clothing and footwear, leather and grain. Bookings for summer grazing (May 1st – October 7th) on Exmoor were also taken, the Moor Bailiff attending all local fairs for that purpose. 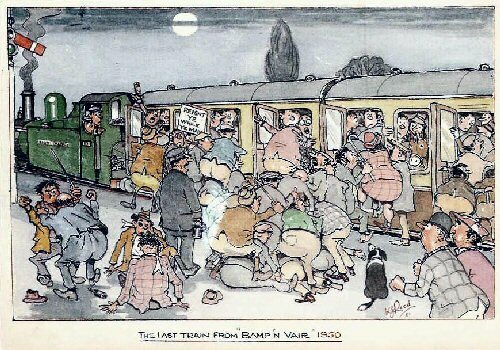 Until around the turn of the twentieth century, there was an unwritten rule that the fair was a no-go area for women, to the point that after the railway came in 1884, the men arrived on the early train whilst the women arrived on a later one, then kept out of the way for the day. Anyone without business at the fair kept out of sight, certainly the local maidens, who remained behind closed doors during the fair, peeking from behind the curtains until later in the day when the business had been completed, when they emerged looking for the lads, and there was dancing and merriment through the streets. Bearing in mind that the roads were not hard surfaced, that it usually rained on Bampton Fair day, and that thousands of animals had passed through, the state of the girls’ long dresses and dainty footwear is a matter best left to the imagination. The odd crook or two was not unknown, typically collecting money on the turn of a card and vanishing into the crowds when a pocketful of change had been gained. Another regular sight was a sandwich-boarded man proclaiming the imminent end of the world and that it was time to repent. He has been making the forecast for well over a century! During the later nineteenth and early twentieth centuries, quack doctors and American hawkers peddled their potions and wares, travelling from one fair to the next. There were wrestling and bare-fist boxing rings, each with a ‘resident’ fighter willing to take on all comers with a wad of notes of the Realm by way of an incentive. Such were the diversions from the main business of the fair. 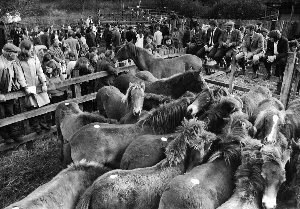 Until 2004 the last ponies had been sold at the fair in 1985 and in recent years the fair suffered somewhat of a decline. This was due not only to the loss of the pony sales but also other influencing factors such as the closure of the railway through Bampton in October 1963, the building of the Devon Link Road which now diverts traffic away from Bampton, our ever changing lifestyles – the motor car, supermarkets and shopping centres and living in the digital age. However a pilot scheme in 2003 identified new directions for the fair and a mare and foal made a welcome appearance by courtesy of the Exmoor Pony Society and for 2004 the most significant addition to the fair was the return of a small pony sale when over 24 horses and ponies were sold for prices ranging from around £80.00 to £2,400. The auction was held at Luttrell Farm, a pony and trap ride from the centre of the town, by Stags Auctioneers & Estate Agents, who are the successors to Dobbs, Stag and Knowlman. In 2004 a joint bid (Bampton Fair Working Group and Pennymoor Singaround) was made to the National Heritage Lottery Fund and a grant of £25,000 awarded. The funding was used to improve the infrastructure of the fair to encourage local producers of foods, crafts and traditional skills, to provide a host of entertainments in the streets, pubs and venues of Bampton including craft and music workshops, demonstrations and concerts, and the start of an archive collecting photographs, film, songs, music and oral memories of the rich traditions and heritage of the fair itself. The fair is currently enjoying a new lease of life, having celebrated its 750th birthday in 2008.